Mr JS and I have amused ourselves of late not just with thimble chatter, but with this satirical print of the English family in Paris. The father is Homeresque in his proportions, and nearly as befuddled. 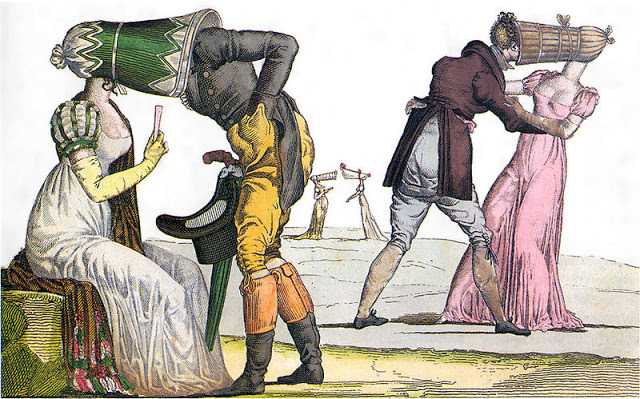 The artist is clearly mocking this poor family, contrasted with the graceful Parisians at left, but only the two youngest are aware, hiding in their cones of shame. That deep coal-scuttle-like bonnet is mocked in other engravings; it is probably closer to the actual form of Julia Bowen’s cold scoop of 1799 than my approximation this fall. Julia would surely have known the shaming purposes of those grandiose and over-sized calashes: “Go sit in your calash and think about what you’ve done!” Mr JS quipped. Appropriately enough, the silk I ordered to make my own calash of shame has arrived at the post office. Dark green taffeta envy lined with the bright magenta of embarrassment: clothes are so emotional. My sons latest hairstyle owes a large fashion debt to the French dandy there! Hahaha! Oh how I love this comparison, it made me laugh so hard…I will never ever look the same way at the Bon Ton series again!